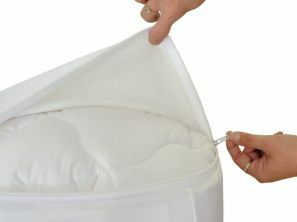 Fully encapsulated, zipped on fits the mattress perfectly. It is a fully waterproof protector. The the most important characteristics of this protector is that it is 100% breathable, eliminating the chances of sweating and dew formation on the mattress protector. This product is resistant to stains, bacteria and order. The upper layer is 100% polyester fabric, lower layer is laminated with protective PU membrane. Silent non wrinkle fabric. Washable at 90°, rinse throughly, and do not iron. PLEASE NOTE THIS PRODUCT IS NOT DUE IN UNTIL 20TH SEPT. 2014. DUE TO THE LARGE INTEREST IN THIS PRODUCT RANGE WE ARE ACCEPTING PREORDERS. CLICK ON THE BUY NOW BUTTON ABOVE TO PREORDER.